Both the bar and the starburst ring are thought to be at least in part the result of the cosmic scuffle between the two galaxies—a merger that has been going on for 400 million years. NGC 1512, which has been observed by Hubble in the past , is also home to a second, more serene, star-forming region in its outer ring. This ring is dotted with dozens of HII regions, where large swathes of hydrogen gas are subject to intense radiation from nearby, newly formed stars. This radiation causes the gas to glow and creates the bright knots of light seen throughout the ring. 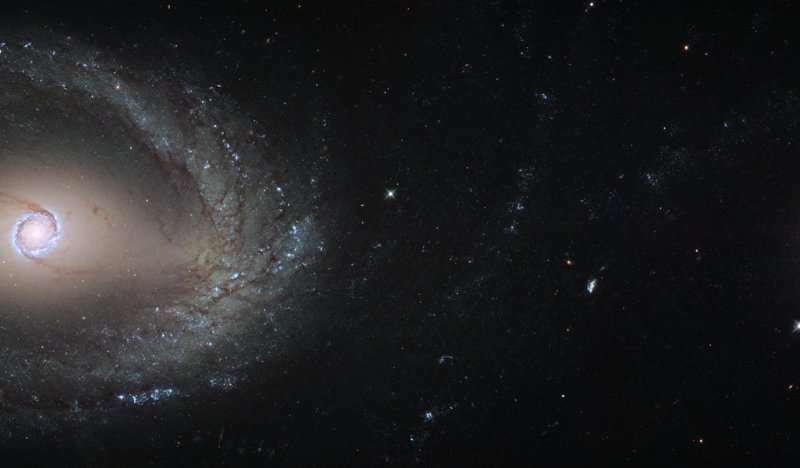 Remarkably, NGC 1512 extends even further than we can see in this image—beyond the outer ring—displaying malformed, tendril-like spiral arms enveloping NGC 1510. These huge arms are thought to be warped by strong gravitational interactions with NGC 1510 and the accretion of material from it. But these interactions are not just affecting NGC 1512; they have also taken their toll on the smaller of the pair.